Over the course of Black Sabbath’s long and storied history, there always remained one key component of their sound: guitarist Tony Iommi. Gilded in absolutely legendary status, he remains one of the pivotal guitarists who helped to establish and define what the true sound of metal guitar was and still is today. When delving into Black Sabbath’s catalog you will find a variety of tunes, ranging from soft-spoken acoustic trips to full out doom-filled shred-fests. This to me is their absolute biggest strength as a band. Tony Iommi drew his influences from the blues and turned it into something a whole lot more. His distorted tone, mixed with a unique style of riffage that is both catchy and ballsy, creates what we’ve come to know as the “Black Sabbath” sound. While his abilities as a riff machine are known far and wide, his amazing abilities as a soloist are sometimes overlooked. Iommi draws his stylings mainly from the familiar pentatonic scale, popular in blues and many other musical forms across the globe. The way in which he utilizes the scale however, is unique. When I was undergoing a personal study of his soloing approach, I noticed a common element throughout: Iommi’s rhythmic phrasing was direct and very deliberate. In other words, he uses a lot of on-the-beat pulses in rhythm with great effect. Of course, he uses more complex phrasings too, but what makes his solos so visceral is due in part to the brash way in which they are rhythmically stated. Add this approach to the bluesy pentatonic scale I mentioned earlier and a generous helping of gain, and you’ll just start to see Iommi’s sound come to life. Another technique he utilized was tracking more than one solo at the same time, resulting in a controlled chaos type of effect that was hard-hitting and at times downright disorienting. I had made an attempt on our Iconic Rigs video at capturing this type of effect. The tracks start off in unison and then diverge from each other a few bars after that. 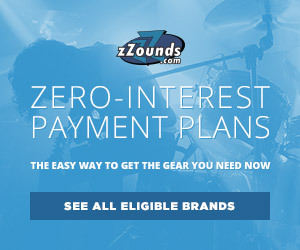 You can hear Iommi use it in action on Black Sabbath’s song “War Pigs” among several others. When you picture Tony Iommi, I’m absolutely certain you are also picturing him with his Gibson SG in hand. As it turns out, this was a backup to a 1960s Fender Stratocaster that he used up until it failed on him during the recording of Black Sabbath’s first self-titled album. Once he turned to his backup, a Gibson SG Special nicknamed “Monkey” due to the yellow cartoon monkey sticker on it, he never looked back. Specifically, the guitar was a 1965 SG Special with a Gibson P90 pickup fitted into the bridge position by John Birch. Birch also designed the custom P90 pickup that would later make it into the neck position. Tony had used Gibson SG Standard models in red and black finishes as well, and even had a custom model built for him by Gibson in 1997. Iommi has also developed a signature model with Epiphone, dubbed the Tony Iommi SG Custom. The model has a number of pro features, including Gibson-made Tony Iommi signature humbuckers, a LockTone bridge, and cool details like cross fretboard inlays Tony made famous. As associated as Iommi is with his Gibson SGs, he’s just as known for his usage of Laney Amps. 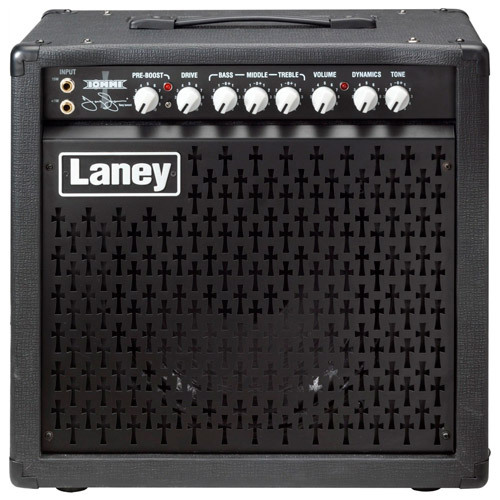 Like Black Sabbath, Laney began in Birmingham, England in the late ’60s. In the band’s early days, Iommi was said to be using Laney Supergroup amps, but went through later periods using a Paul Reed Smith-modified Marshall JCM800, Marshall Silver Jubilees, Marshall 9001 Power amps, and Mesa Boogie Mark Series amps as well. In spite of this, in the early ’90s Iommi needed a company that could make him an amp for his specific touring needs and, coming full circle, he would contact Laney once again. The partnership eventually yielded the Laney GH 100 TI amplifier, a 100-watt signature head complete with Iommi’s molten tone. For those who didn’t need that beastly of an amp, Laney recently dropped the TI15-112 15-watt combo amp, which has a gain circuit modeled after the TI100’s high-gain channel. The TI15-112 was the amp that we used in our demo video to replicate the Iommi sound with great results. The overdrive was tight and focused but also could be dialed back for an excellent crunch sound. Tony is said to be using this amp as for backstage practice as well. As far as his cabinets go, Tony is running 8 Laney GH TI 412S Tony Iommi Signature cabinets all loaded with Celestion G12H model speakers. 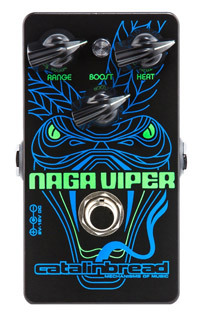 For his effects, he has famously used a Dallas Rangemaster Treble Booster to get his cutting and snarled tone (try a Catalinbread Naga Viper Treble Booster for an excellent modern replica of this unit). He has also been said to have used a host of other pedals throughout Black Sabbath’s history, including the Boss OC-3 Octave pedal, an MXR Flanger and Phase 90, as well as a Dunlop Uni-Vibe, to name just a few. 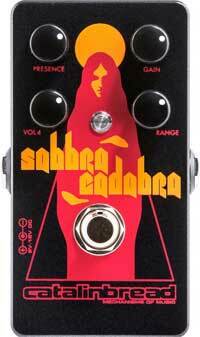 And if you want instant Iommi in-a-box, check out the Catalinbread Sabbra Cadabra. If the name and artwork weren’t enough of a clue, this overdrive/boost brings you the sounds of the Rangemaster and Supergroup in one. Tony Iommi is the man behind the sounds that defined modern heavy metal music as we all know it. Without his contributions and unmistakable tone and riffs, history would simply not have transpired the way it did. 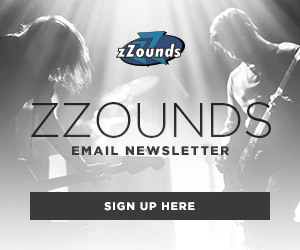 So let’s all just take a moment to sit back, crank up our amps, and let those power chords rip.